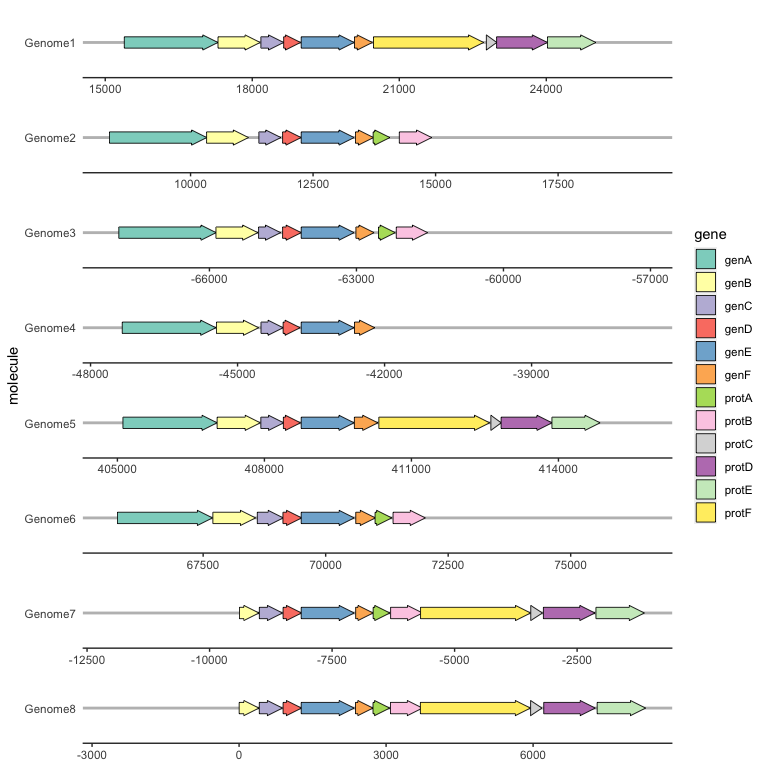 geom_gene_arrow is a ‘ggplot2’ geom that represents genes with arrows. The start and end locations of the genes within their molecule(s) are mapped to the xmin and xmax aesthetics respectively. These start and end locations are used to determine the directions in which the arrows point. The y aesthetic must be mapped to the molecule(s). If you are drawing more than one molecule, and the numerical locations of the genes are not similar across molecules, you almost certainly want to facet the plot with scales = "free" to avoid drawing ridiculously large molecules with ridiculously tiny genes. Because the resulting plot can look cluttered, a ‘ggplot2’ theme theme_genes is provided with some sensible defaults. Often you will want a certain gene to be vertically aligned across the faceted molecules. 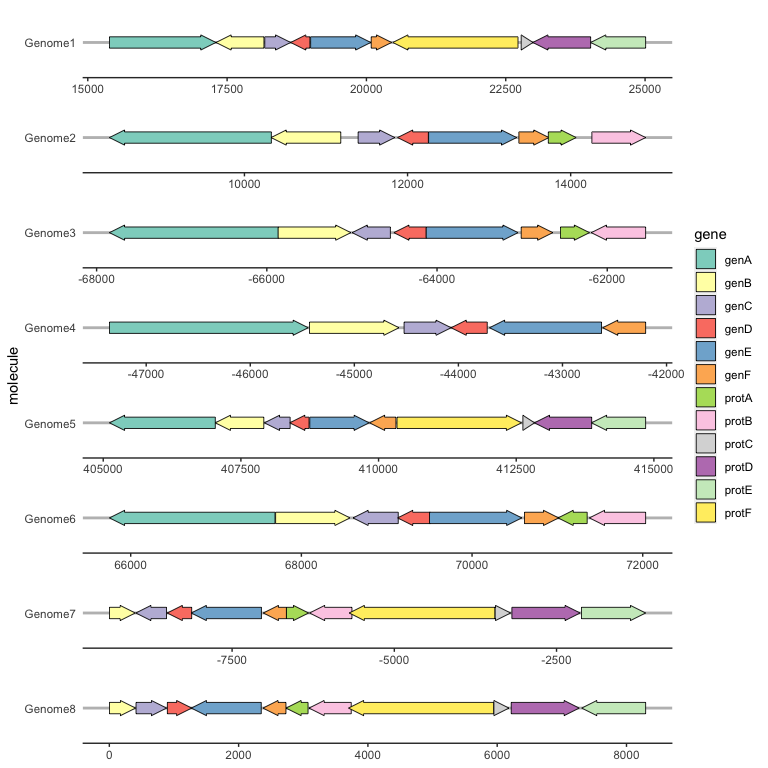 make_alignment_dummies generates a set of ‘dummy’ genes that if added to the plot with geom_blank will extend the range of each facet to visually align the selected gene across facets. 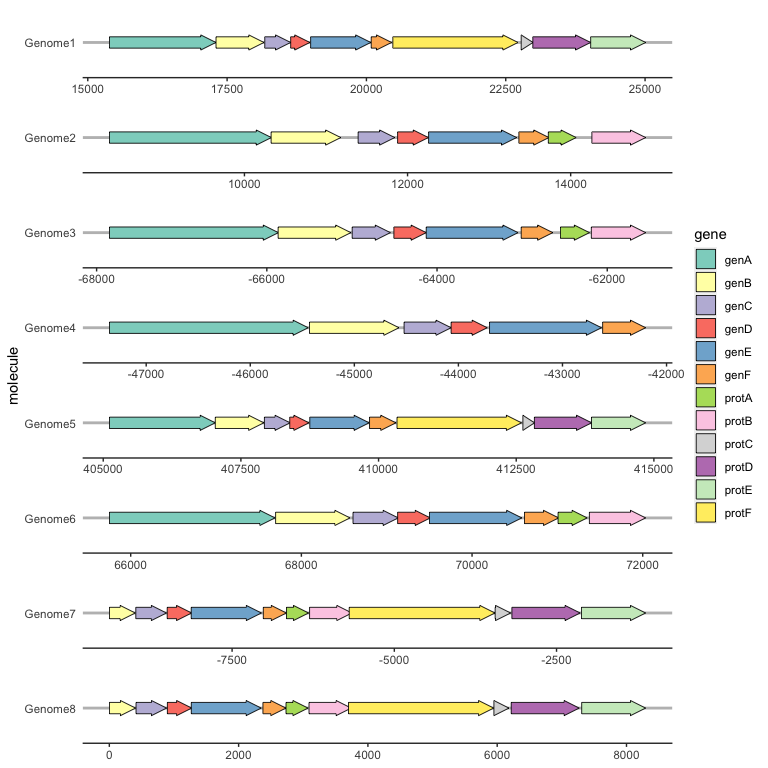 To label individual genes, provide a label aesthetic and use geom_gene_label. 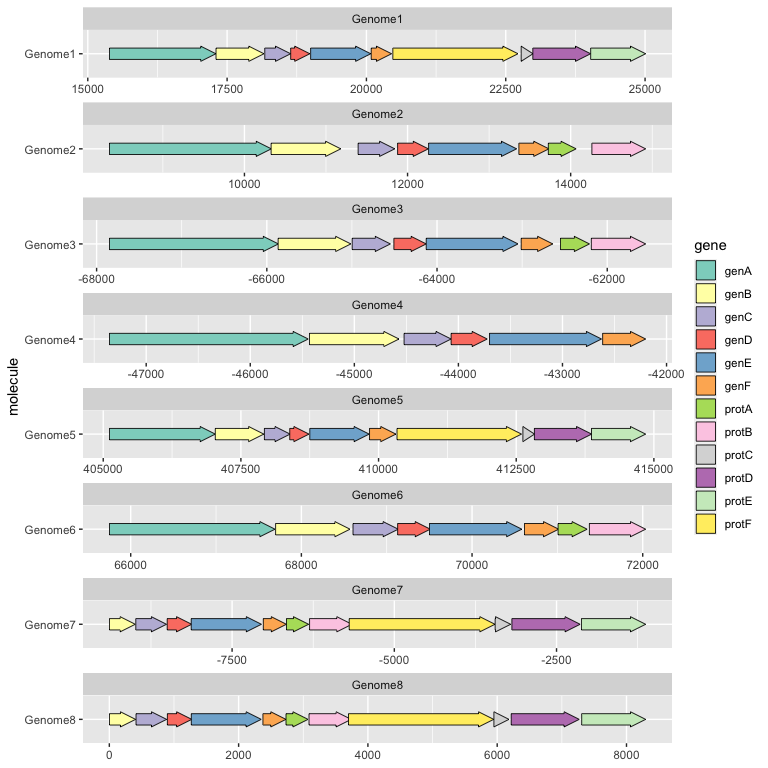 geom_gene_label uses the ‘ggfittext’ package to fit the label text inside the gene arrows; see the ‘ggfittext’ documentation for more details on how it resizes and reflows text to make it fit. Sometimes you might want to reverse the direction of some genes from that implied by xmin and xmax. For example, you might want to draw both a forward and reverse strand within each facet, and reverse the direction of all the genes on the reverse strand. The optional forward aesthetic is intended for this sort of situation. If forward is TRUE (the default), or any value that coerces to TRUE such as 1, the gene will be drawn pointing in the normal direction, i.e. that implied by xmin and xmax. If forward is FALSE, or any value that coerces to FALSE such as -1, the gene will be drawn in the reverse of this implied direction. In the following example, the forward aesthetic has been used to reverse the direction of all genes on the reverse strand from that implied by xmin and xmax.